To follow on from the last post, so if your lens has now matured nicely in its eyeball and is no longer focusing as well as it used to, what can you do? The simplest, time proven method is the spectacle. Spectacles are great-besides being a fashion statement, people like me gain an air of authority at work and they are also eminently adjustable and flexible. Your eye power changed by 50 degrees? No problemo, your friendly neighbourhood optometrist just needs to change the spectacle lens and Voila! everything is nice and clear again. But...spectacles fog up, they can collect droplets of rain/sweat/etc, and if they are only used for reading they are often lost or they are not handy just when you needed them. Progressives give you a narrower field of vision and require slight adjustments of head position to work well. With contact lenses, monovision can be used (one eye corrected for far, the other corrected for near),or multifocal contact lenses can be worn to reduce the need for near reading glasses, but they are not perfect too and also there is the hassle of wearing them. So, many clever people have thought up ideas to get around this problem while avoiding the need to wear glasses or contact lenses. Primarily the procedures can be divided into corneal operations and lens operations. In terms of corneal operations, the most recently promoted procedures (fads? 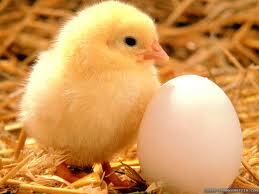 time will tell...) are corneal inlays, which are tiny pieces of special plastic implanted inside the cornea* itself. *This is the transparent part covering the front of the eyeball. The first of these inlays that comes to mind is the Kamra, which had been undergoing trials in Singapore some years ago. This is a very thin circular membrane with a central opening that is like a very tiny doughnut, and acts like a pinhole to sharpen images which would normally be out of focus. The black polyvinyl pyrrolidone disc is 5 microns (0.005mm) thick and has a central 1.6mm diameter hole. Surrounding this hole is a rim which is perforated with thousands of microscopic openings that allow nutrients to pass through. 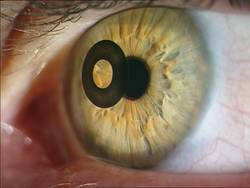 This disc is implanted under a LASIK type corneal flap or into a pocket dissected within the cornea. Most of us with some degree of long/shortsightedness or astigmatism know that if we squint or close our eyelids partially, vision can get a little sharper. This is because doing so creates a kind of ‘pinhole’ effect. Light rays entering dead centre of the cornea and eye do not have to be accurately focused to create a relatively sharp image. Similarly photographers know that if you step down the aperture to eg f11, you can increase the depth of field of the picture so that more things in the fore and backgrounds appear in focus. In fact, published articles report that many patients experienced better near vision after having had this implant. However, photographers also know that if you step down the aperture excessively, image quality suffers. This is a result of diffraction, a physical phenomenon where light spreads out from a small point source. The smaller the light source, the greater it spreads out (in relative terms) and the blurrer an image gets. Among other factors, this is one source of the halos that patients with the Kamra inlay experience. 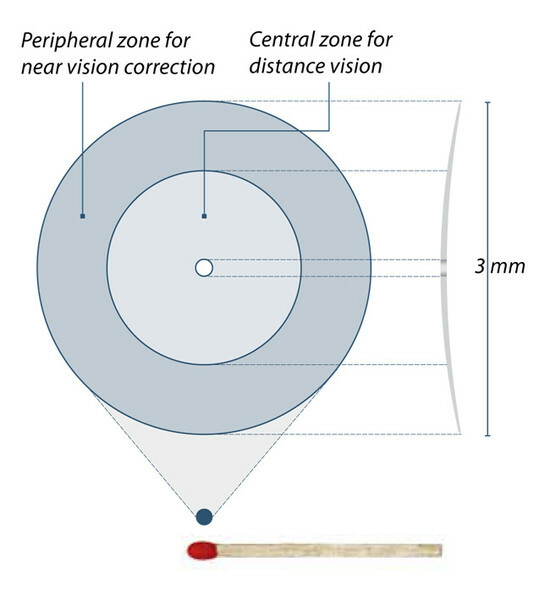 This is a small, 3mm diameter disc shaped implant with a 0.15mm channel in its centre to allow for the diffusion of nutrients within the cornea. The periphery of this implant has extra reading power to help with near focusing, while the centre of the implant has no power to allow for good distance vision. It is also placed under a LASIK type flap like the Kamra inlay above. While this sounds like it could work in theory, in practice it is not so simple. Devices like this are dependent on pupil size, and if a patient’s pupil size happens to be bigger than usual then the effect is less than expected or the patient may experience significant halos from light scattering at the edge of the implant/multifocality. There is also some concern that the central channel could get blocked up in the long term from deposits that were seen to develop with other, earlier types of corneal implants. This implant is so called because it looks like a droplet when implanted in the cornea (like the 2 other inlays above, also under a LASIK type corneal flap). It works by increasing the curvature of the central 2mm of the cornea, with the increased curvature helping the eye to focus for near. However, in a similar way to the Icolens, the patient's pupil size will affect the usefulness of the device and there is a very real risk of halos and distortions due to the multifocality induced by the implant. The increased central curvature on the cornea also makes that eye more shortsighted, and you can actually get this effect from plain monovision in the first place! The only positive thing about any of these corneal inlays is that they can be removed and the procedure reversed. But personally if there was even a 2 or 3 percent chance that a patient would not like an implant and request its removal, I don't think it's worth the effort and financial cost involved, plus the blurred vision and side effects that necessitate reversal of the procedure. 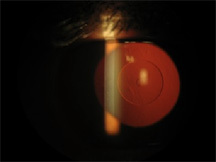 PresbyLASIK is basically LASIK, but in this case using the excimer laser to sculpt the cornea into a shape to give the effect of either the Icolens (centre-far presbyLASIK) or the Raindrop implant (centre-near presbyLASIK). Suffice to say this has not really caught on either, due to a high chance of poor quality vision/halos as above, and also the high chance of not getting the desired effect of good near vision. If anything, presbyLASIK gives less predictable outcomes than corneal inlays, and that is because the body tends to smooth out the newly sculpted shape, leading to a regression of effect. In the second part of this series I will be giving my take on something just a little more promising-lens implants for improving near vision. **If any reader has had corneal inlay surgery done and would like to share their experience, I would be most grateful if you could add your comments below!